PT Sonton Food Indonesia (SFI) is a joint venture manufacture established by Sonton Holdings Co Ltd Japan and PT Mahadana Dasha Utama (Mahadasha) Indonesia. The manufacture will produces jam, spread, and custard for B2B business with capacity of up to 7000 tons per year. “Our main target for this year is foodservice business, bakery industry, and pastry industry,” said Edy Jeo, General Manager Sales and Marketing PT SFI. While manufacturing is a new experience for Mahadasha, Sonton Holdings Co Ltd Japan has been producing spread since 1942. With Japanese technology and more than 70 years’ experience of Sonton, PT SFI also intends to penetrate not only B2B business in Indonesia but also retail market and Southeast Asia market. "This is the first Sonton manufacture built outside Japan. I have good expectation for our selling since Indonesian market has more significant increase compared to other countries in Southeast Asia market," said President Director PT Sonton Food Indonesia Nobufumi Ohuchi at PT SFI Media Factory Visit’s Press Conference (15/12). 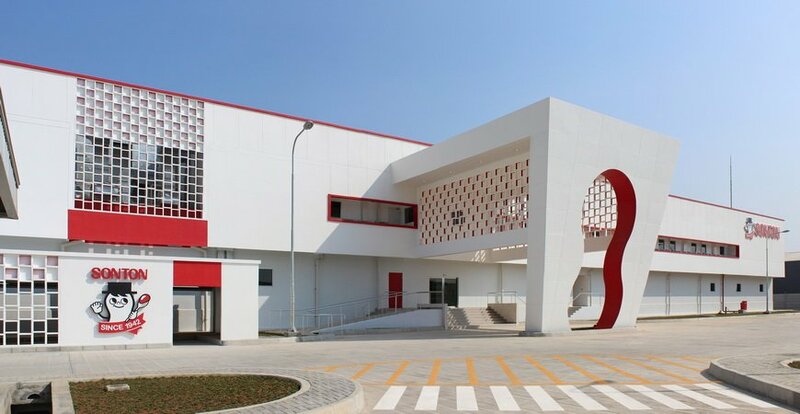 On an area of 30,361 m2, PT SFI built a factory that utilizes all automatic and semi-automatic machines. With those machines, PT SFI employs not more than 50 people. "It also aims to minimize contaminants in our factory as our factory is very clean and sterile. We special protocol for those who will enter our factory which involves air pressure system, air pulse system, cleaning room," said Operation Director PT SFI Jumpei Akui. Now, PT SFI has 12 variants of products. It includes matcha spread, chocolate spread, banana custard, pineapple jam, strawberry jam, and blueberry jam which are available with crispy corn flakes addition. All of the products can be customized depends on the client's demand as well. "We use mostly local ingredients from Java, Sumatera, and Celebes. All of our ingredients are also halal certified," said Edy Jeo. The Japanese technology enables some of the products to hold their shape when exposed to heat when used as bread filling and can be frozen without sacrificing its form. "With the developing of middle-class people's lifestyle of Indonesia, we hope that our products can be cherished in Indonesia market," said Ohuchi. Address: Delta Silicon III - Lot F23 No. 23, Cikarang Pusat, Bekasi.